A komodo dragon attacked a man as he ate lunch at a building site on one of the giant lizards’ protected island habitats, police said on Monday. Construction worker Agustinus Jenaru, 20, was having a meal break when the powerful monitor, apparently attracted by the smell of food, crept up from behind and bit him on the arm, police official Mega Laksana Putra said. “The man screamed for help. He put up a struggle and managed to free himself,” Putra said. There are no medical facilities on Rinca, a komodo sanctuary in eastern Indonesia, so Jenaru was flown to hospital in Bali, he said. Until recently komodos were believed to hunt with a “bite and wait” strategy using toxic bacteria in their saliva to weaken or kill their prey, before descending in numbers to feast. But in 2005 researchers found that dragons’ jaws are armed with highly sophisticated poison glands that can cause paralysis, spasms and shock through haemorrhaging. 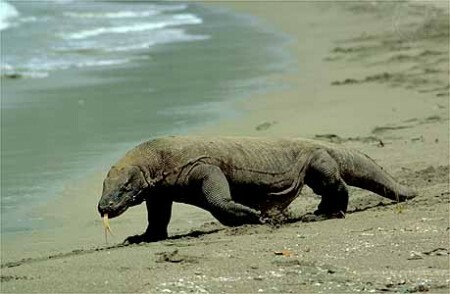 The world’s largest monitor lizard, komodos can grow up to three metres and weigh up to 140 kilograms. They are unique to a small group of islands in eastern Indonesia.